We’ve had a lot of people sending in this photo of the N8 supposedly with Symbian Belle so it must be something worth sharing no? 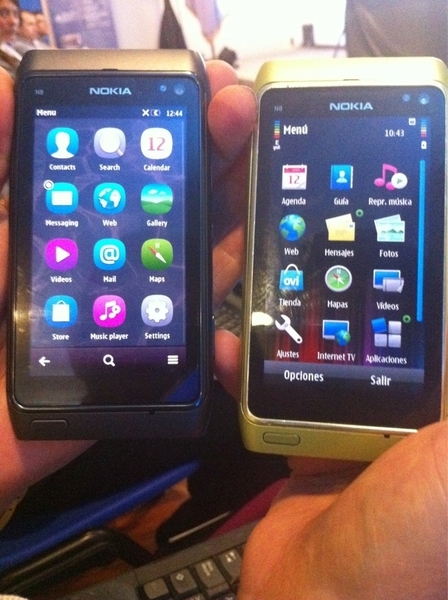 I guess it’s useful to have a comparison with normal Symbian^3 to the newer, “revamped” or well, “touched up” Symbian. 1) Consistency of the new UI right (this is overlooked but consistent interactions with menus/buttons are a MUST). The core apps must share as much button layout as possible. 2) Speed just fast enough (it is unacceptable in 2011 to accept even the smallest perceivable lags. Either do something instantly or use pleasant animations to distract. I oddly prefer the latter as animations can be used not just for distraction, but to give you a cue that something is happening). …then that will really improve the overall Symbian experience – something so feature packed but just needs streamlining to get the features easily into people’s hands (since smartphones are no longer just for smart people that are willing to tinker around with phones). Some of you may have jumped ship already whilst waiting for Anna and so Belle is something much not worth thinking about. For those willing to wait, it’ll freshen up your Symbian^3 device. I think though that Belle is more suited for the newer breed of Symbian handsets. It’s somewhat a shame that Symbian is now accepted as being dumped and ‘dead’. I’m concerned with the uncertainty of the platform, despite the said 2016 support (which is also when Nokia’s 5 year WinPho deal “ends” right?) I feel that there’s now more of a future at least in terms of app support for Windows Phone. MeeGo/Harmattan might possibly give the whole Qt ecosystem a boot up the backside. Who knows what Windows 8 might do – Windows is Qt compatible. Cheers again to all who sent this. I forgot where this pic actually came from but I think it was saved to my desktop from @Camb078? I could be wrong, it’s been sitting on my screen for about 3 days (growing backlog of tips due to exams). « Pre-Order Nokia X7 NOW!